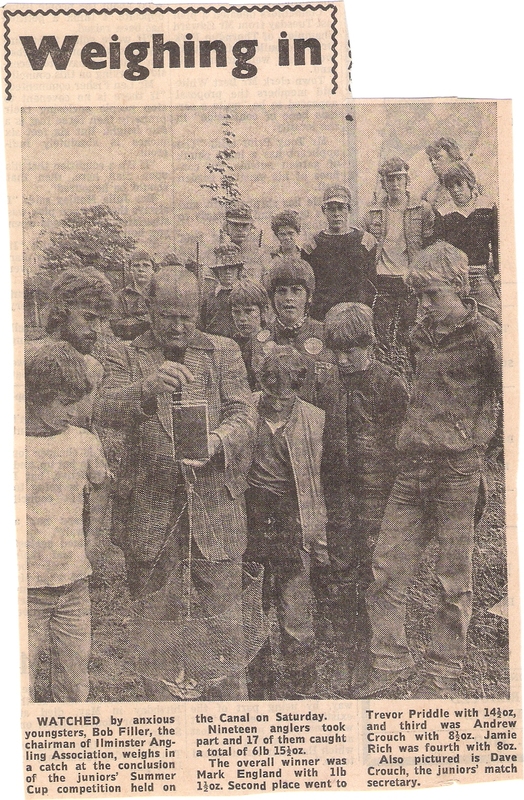 So Part 1 detailed my introduction into fishing and my first tentative steps onto the junior match scene in 1980, Part 2 takes up the story on June 17th 1981. There was still a close season in place and I can only describe the countdown to June 16th as something akin to the excitement of waiting for Xmas day. I can’t remember why I didn’t fish the 16th but it may well have been to do with avoiding the crowds as the canal was a relatively small water and used to get pretty busy on the first day. My records showed that I caught 58 rudd and roach, 2 eels and a 2lb tench so my fishing had improved hugely compared to the meagre catches I was recording the previous year. I still had the 13 foot match rod and was using bronze maggots but had now added a 8.5 foot ledger rod and a Mitchell 206 reel to the armoury. The first match was on 28th June and it was interesting to note it was fished using the points and ounces format where you got a point for every ounce and a point for every fish with the highest points score winning. The junior matches were well attended with 14 fishing this one. I had 29 fish for 1lb which gave me 45 points to finish in second place behind Trevor Priddle who had 40 fish for 15oz. Most of the fish were caught by casting as tight as possible to the far bank, no poles back then. Also looking through my diaries and photo albums, carp had by now lost their almost mythical status although they were still a prized catch and not the nuisance they are nowadays. They weren’t big fish, typically between 2-5lb with a six pounder being a big fish. Lots of fish were caught on floating crust which was great fun. I was still fishing matches, mainly on the canal, and doing well although that first win eluded me. 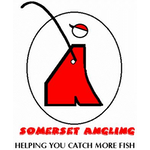 We also travelled further afield when Ilminster entered two teams into the Junior South of England Team Championship on the River Huntspill. To be honest, we struggled due to a lack of experience as fishing a big wide open drain was totally alien to us. The ‘B’ team fared slightly better, finishing 21st out of 27 teams, the team consisted of Ian Priddle who caught 1lb 6oz, Richard Priddle (1lb 1oz), Steve Pittard (10oz) and me (10oz). 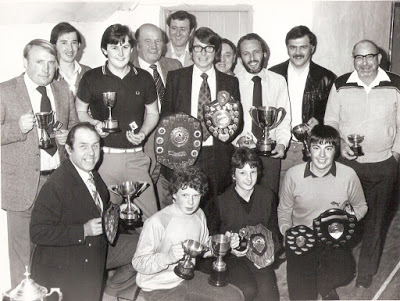 The ‘A’ team (and you’ll probably recognise a few names here as well) were Dave Tolman, Mark England, Dave Phillips and Lee Crossland who received a trophy for the youngest angler competing to weigh in at the tender age of nine years old! At the start of my third season I was down the canal on the 16th and caught 52 fish for around 2lb in total, not a massive catch but plenty of bites, I was using a 2BB Stillwater Blue, a lovely delicate little float, made by Drennan I think. The matches kicked off on 27th June and the first one saw 22 youngsters line the banks of the canal (how we all squeezed in, I’ll never know!). I caught 38 rudd and a roach for 7.5oz which gave me 46.5 points and I finished third. The next fixture on the canal I had 9 fish for 9oz which included a gudgeon, it was also the start of the pairs competition and my partner was Mark England who was winning everything at the time. The Summer Cup was fished on the canal by 19 juniors and Mark England won again, I was fourth with 8oz. In the photo above, IAA Chairman Bob Filler Snr can be seen weighing in, also pictured was Dave Crouch the junior match secretary, Dave was a massive influence and helped me so much in those early years. I recognise most of the youngsters in the photo but there’s a few I’m struggling with, front row left to right, I can’t remember the lad on Dave’s right, Bob Filler, Ian Isaacs, Neil Dopson, Dave Tolman, Stephen Hallett and Pete Bennett? (not sure), back row, Shaun ?, Jason Miles, Stuart ‘Fred’ Brown, Paul Brion, Andrew Crouch, me, Richard Priddle and Trevor Priddle. 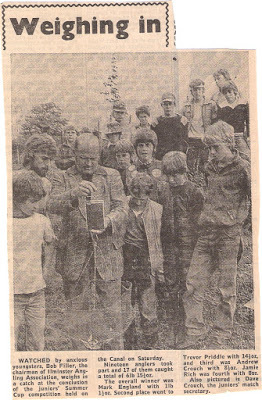 Talking of early influences, three other people I must mention are Trevor Hyams, Richard White and Andy Langdon, three anglers who used to fish the canal a lot and I used to sit and annoy them with all my questions. 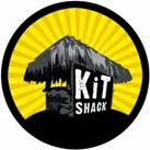 Trevor gave me my first seat box and used to quite often pick me up some bait from Rule’s tackle shop. I’m still good friends with Rich after 36 years although we don’t see each other nearly enough and Andy went on to become one of my best mates. Regular fishing companions around this time included Dave Tolman, Stephen Hallett and Terry Busby. After being the bridesmaid on several occasions, I finally won my first match on 12th December with victory in the Xmas Fayre. I caught two chublets, two roach and two dace for 1lb 6.5oz and won a tin of biscuits and the grand sum of £1 in pools money! I fished a stick float with bronze maggots as bait, a classic combination. The river was very high and it was a struggle for most with only three from a field of twenty troubling the scales. I seem to recall I caught all my fish running down in the crease between the slacker water created by my keepnet and the main flow. Xmas that year was a memorable one as mum and dad bought me an A.W. Rule’s 12 foot carbon rod, a lovely bit of kit. I christened the rod down the canal on 28th Dec when I caught seven rudd and a gudgeon. The clubs presentation night was held at the Lord Nelson and I was proud as punch to be the first name on the Xmas Fayre shield which was a new trophy and Mark England and me won the pairs although in truth, he pretty much won it single handed! Very interesting to read your story, as it is a little bit similar to mine (although I didn't do much match fishing. 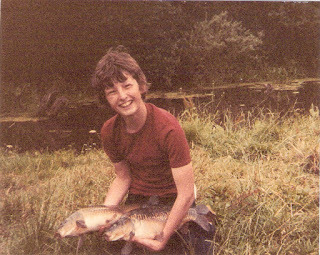 I started fishing when I was a young boy, back in the south of England (River Stour and the river Allen). Used to fish a lot for things like Perch, Pike, Chubb, Roach, Dace and Rudd. Then started to do more lake fishing for Carp and tench. I also lived in Thailand for 6 years, and have fished in some of the fishing parks there. I now live in Australia, and have started fishing a lot again since I moved here a couple of years ago. 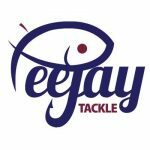 thanks for your feedback, glad to hear you're enjoying reading my posts, what sort of fishing do you do in Australia? always looking for guest posts, if you fancied writing one.